* Reviewed Joe and Kristin Navas’ resignation from offices of President and V.P. Leaves on the ground mean cooler temperatures, long runs and fall marathons. This weekend, many club members will be hitting the pavement at Marine Corps Marathon, the Cape Cod Marathon, and the CCM Relay. With Boston already filled, the pressure is off to get a BQ so have fun with it. Good running to all! Also belated congratulations to Tom Deeg for his 12th place finish at Baystate two weeks ago in a time of 2:30:10. 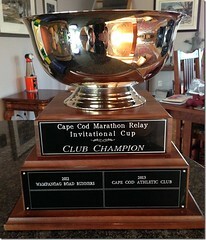 And if you’ve been on the road for a recent marathon, send your times to ccac@capecodathleticclub.org and we’ll post them on the Results Pages. 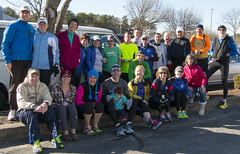 I have been running a beginner’s walk/run class at the local high school for a dozen years now. That is, a Spring class and a Fall class, both comprising 12 weeks, wherein we start at the level that most middle-aged couch potatoes can handle, and move on up incrementally from there. I call it my caterpillar-to-butterfly metamorphosis show, acted out in 12 progressive stages to a final curtain closing three mile road race, often coinciding with one of the several Turkey Trots hosted on Thanksgiving Day in various towns here on the Cape. 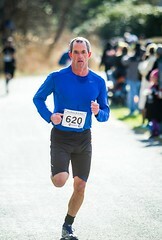 Ultrarunner Michael Wardien won the Hartford Marathon yesterday in 2:24:38. 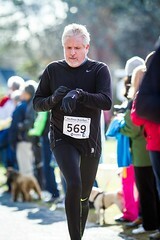 What was very refreshing for me was that Bob Jensen of Cotuit, age 57 or 58, qualified for Boston by running 3:42. This was a sweet reward after many years of trying to qualify, and represented a personal record by a full 30 minutes. He said his secret was losing another 16 lbs. "Jiggling is definitely out now," he said. Many of you know Bob as the colorful laugh-a-minute co-race director of the Cape Cod Frozen Fatass 50 K that we hold every winter here over at Sandy Neck. He is a great believer in the "if at first you don’t succeed"… code. He attempted quite a few 100s before I had the sweet pleasure of watching him come up Rt. 66 in Oklahoma (next-to-last!) back in 2006 and finish his first 100 after MANY tries at Vermont and Umstead, etc. 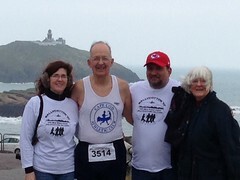 Bob has been the volunteer crosscountry coach at the St. Francis Xavier middle school in Hyannis for many years, and runs t he most fun practices I have ever watched in sixty years of observing running programs. One only has to watch 42 kids play the running game of Lambs & Lions in an afternoon track practice to fully appreciate how skinny kids, fast kids,average kids, and yes, slow kids and fat kids can ALL have a blast while practicing their running together. There is plenty of sweat and huffing and puffing involved, but no work! Join Lyme Awareness of Cape Cod for their 2nd Annual Spin-A-Thon for Lyme. On October 23rd, athletes will gather at Fitness 500 Club in Hyannis and spin from 10am to 2pm to raise money to fight Lyme disease. You can register to ride and reserve a bike now or if you don’t want to spin, consider making a pledge to a spinner. Get our your calendars and get ready for the Winter Grand Prix! While dates and locations aren’t firmed up yet, the initial schedule includes stops at Campari’s in Chatham, the Graeber’s in Orleans, Yarmouth PD, Weary Traveler’s in Monument Beach, Chapin’s in Dennis, Liz Broderick’s home in Dennis, and Kurt Martin’s new (almost completed) house in Orleans. The action is tentatively set to start on December 5th. Watch the site and the race calendar for updates as we approach December. And if you’re interested in securing a spot on the Grand Prix calendar, e-mail ccac@capecodathleticclub.org as soon as possible. On September 30th, the Board of Directors voted to accept the resignation of Joe and Kristen Navas from the positions of president and vice president respectively. Citing family duties and other external pressures, Joe thanked the board and officers for their support in this decision and noted that he will continue to be actively involved in club activities. Bob Eckerson and Joe Weinberger were selected by the board to serve as interim president and vice president respectively. At the October 6th monthly club meeting, Larry Cole was unanimously elected to fill the board position now vacated by Joe Weinberger. Interim officers and board member will serve through the next club elections to be held in April 2011. At the October meeting, we also welcomed Mary Ellen Ross to her first meeting in her official capacity as club secretary. Mary Ellen was elected as interim secretary at the September meeting and will be publishing meeting minutes in the Member’s Only section of the website on a regular basis. We welcome the new (and returning) officers and thank Joe and Kristen for their year and a half service to the club.